Readers were eager to share their Little Free Library stories and photos with us, it turns out, with one fan getting in touch from Yakima. Also: Island Books has new owner; “The Cartel” goes from book to screen. In May I wrote a column about my Little Free Library, a free-standing wooden box on my parking strip that’s basically a repository for free books, with an invitation to passers-by to take a book, leave a book. I wrote about the pleasure of being a Little Free Library owner, not least of which is observing Little Free Library patron behavior. Yakima librarian’s Little Free Library: This beautiful purple edifice, a sort of miniature Victorian “painted lady,” is the property of Mary MacKintosh, of Yakima, a librarian by profession. Like me, she was blessed or buried, depending on your point of view, by a large number of review copies, and she wanted to share. “I live on a ‘walking street,’ ” she wrote, “where the speed limit is low and many people walk with their children and dogs. The library has been a big hit with the neighbors. Children’s books fly out of it, and the turnover rate shows that people use it regularly. 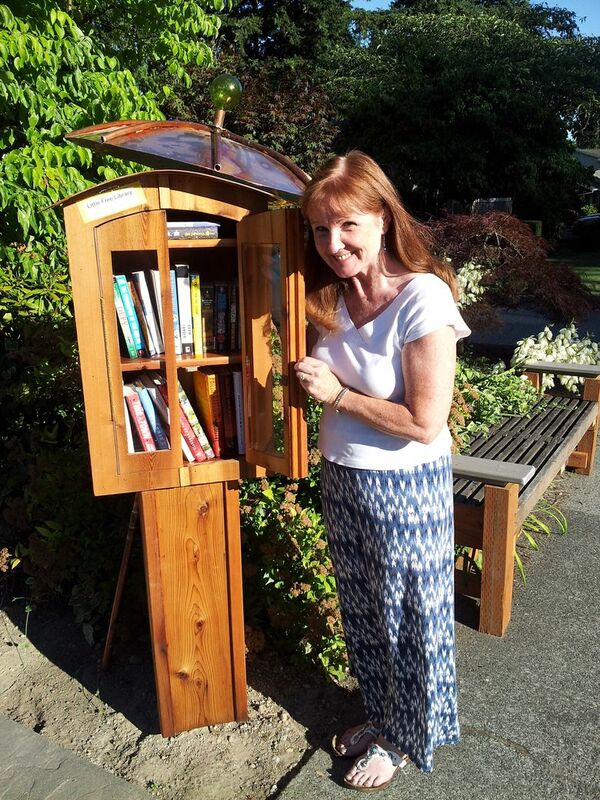 Little Free Library with its own umbrella: This beautiful structure belongs to Gail DiRe, another Seattle-area bibliophile with a book-storage issue. DiRe escorts visiting authors around town, and publishers are always sending her books. She designed it, her husband built it, and they even installed a bench next to it. They live on a curving, winding street with an elementary school nearby, she wrote, and “ … our street is one of the main long straight streets, so we get a lot of walkers.” The Little Free Library got conversations going, and there were even more fringe benefits — one of her 85-year-old neighbors brought her a loaf of homemade bread in thanks. 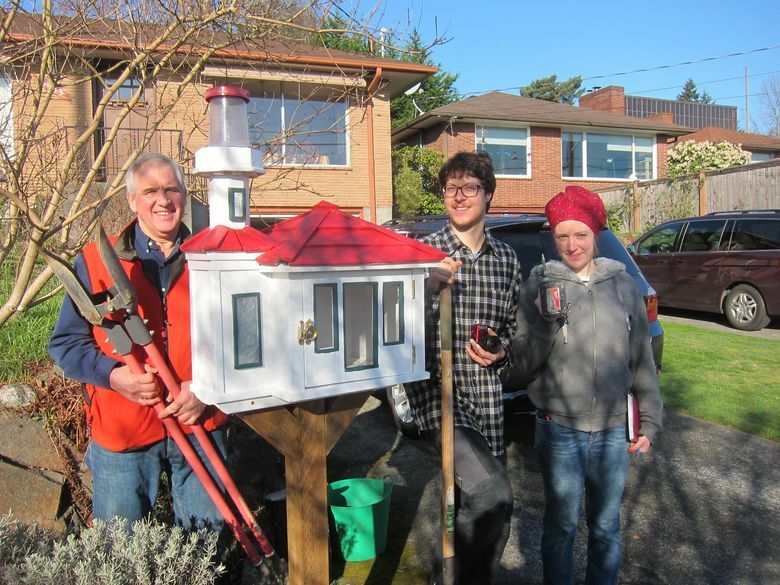 Lighthouse replica Little Free Library: This fabulous piece of work was commissioned by David McKee, a Seattle resident and lighthouse fan. 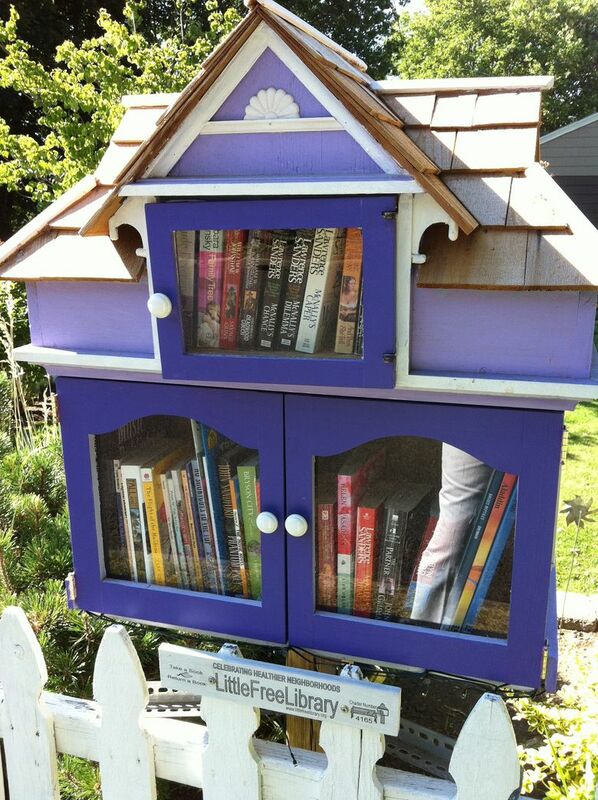 He collaborated with his brother-in-law Dale Hoff, who designs and builds Little Free Libraries for a living. You can see more of Hoff’s work at handcraftsinwordandwood.com — I am pretty darn taken with the “Grandma’s in Winter” model. McKee’s great-grandfather, Edward A. Brooks, was head keeper of the Mukilteo Lighthouse for 12 years, a final posting. “Our mini-library is a reminder of his final outpost, with both of the lighthouses at Alki Point and West Point, within Seattle’s city limits, featuring similar lines,” McKee wrote in an article for Lighthouse Digest. Torch-passing at Island Books: It’s been five years since I published a column on Island Books, an independent bookstore and community reading-oasis on Mercer Island. Owners Roger and Nancy Page have had a long history with the store — Roger started there 30 years ago as a giftwrapper. The store has thrived, but just as the Pages were starting to wonder about the “next chapter,” one “familiar and well-liked customer” dropped a hint one day that she had always wanted to own a bookstore,” goes the story on their website. Long story short — Laurie Raisys, who has been working in the store, assumed ownership of the store on July 1. You can read the full story at mercerislandbooks.com. The Pages will continue to work at the store as booksellers. Parenthetical note — the first owner of the store, Lola Deane, still shops there, according to Roger Page. “The Cartel” — the movie: In July I published a Q&A with Don Winslow, author of the mesmerizing and horrifying novel “The Cartel,” a fable of the futility of the War on Drugs in America and Mexico. At the time, Winslow said “The Cartel” would be made into a movie. Last week Winslow tweeted that Ridley Scott, the director of “Blade Runner,” Gladiator,” and “Black Hawk Down,” will direct. Mary Ann Gwinn: 206-464-2357 or mgwinn@seattletimes.com. Gwinn appears every Tuesday on TVW's "Well Read," discussing books with host Terry Tazioli (go to www.tvw.org/shows/well-read for archived episodes). On Twitter @gwinnma.